He reportedly became enraged when he saw a TV report about him. 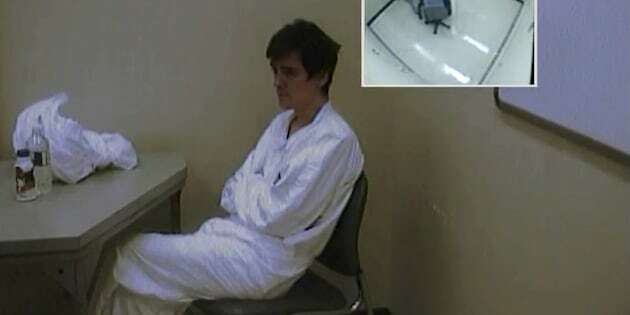 Police interview Alexandre Bissonnette on Jan. 30, 2017, the day after the mosque attacks, in this still from an interrogation video shown by the Crown to the sentencing hearings in Quebec City. Quebec City mosque shooter Alexandre Bissonnette told a fellow inmate he couldn't believe a man he pumped seven bullets into didn't die, a Crown prosecutor told his sentencing arguments Wednesday. Francois Godin said Bissonnette made the comment when he saw Aymen Derbali on TV. Derbali lost the use of his legs in the January 2017 murderous rampage and is confined to a wheelchair. The Crown said the other prisoner told Quebec provincial police this past February that Bissonnette became enraged when he saw a TV report about a campaign to raise funds to buy Derbali a wheelchair-accessible home. "My parents will have nothing" and Derbali will get a house, Bissonnette reportedly told the inmate. The Crown did not explain why it did not file the prisoner's declaration as evidence during Bissonnette's trial but brought it up Wednesday during the cross-examination of a psychiatrist hired by the defence. The prisoner's comments constitute hearsay as he did not testify at the trial, and Superior Court Justice Francois Huot said he will not take into account the exchange when he decides on a sentence for Bissonnette. The first-degree murder conviction carries an automatic life sentence with no chance of parole for 25 years. But Bissonnette can also receive consecutive sentences, which means he could spend up to 150 years in prison. Godin mentioned the reported exchange between Bissonnette and the other convict as he cross-examined psychiatrist Marie-Frederique Allard about what he viewed as the killer's lack of empathy toward his victims. Even the judge weighed in on the subject, telling Allard that Bissonnette had remained impassive while hearing "blood-chilling" testimony from victims' loved ones but that he immediately burst into tears when his own family was mentioned. "Then the waterworks are turned on," Huot said. Allard said she believes Bissonnette has made certain progress in terms of showing empathy and that he has the capacity to further develop it. The defence announced Wednesday it has completed its arguments. In order to answer the defence's psychiatric assessment, the Crown asked that Bissonnette meet on Wednesday afternoon with a psychiatrist of his choice. That person may testify Thursday morning.